Cookbook #249: Grilling and Barbecue, Cook’s Illustrated Guide, a Best Recipe Classic, by the editors of Cook’s Illustrated, Brookline, MA, 2005. 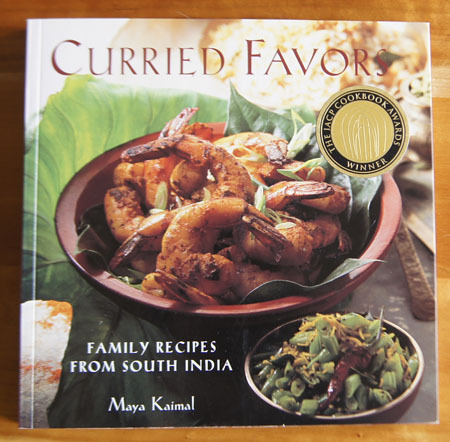 My second-to-last cookbook in this 250 Cookbooks blog! Hard to believe this 5-year project is coming to an end. Cook’s Illustrated guide cookbooks are always among my favorites. Besides Grilling and Barbecue, I also have Cover and Bake and Best International Recipe. 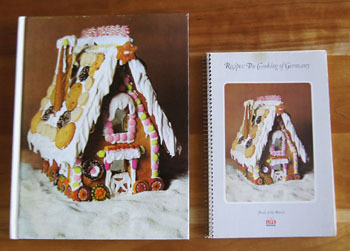 I’ve discussed the style of Cook’s Illustrated recipes in my previous posts on those two books. Briefly, you don’t just get a recipe, you get pages of discussion about how that recipe was developed – what they tried that did and did not work. 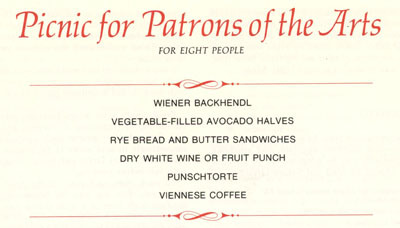 Further information about ingredients and techniques is presented in boxes or side notes. 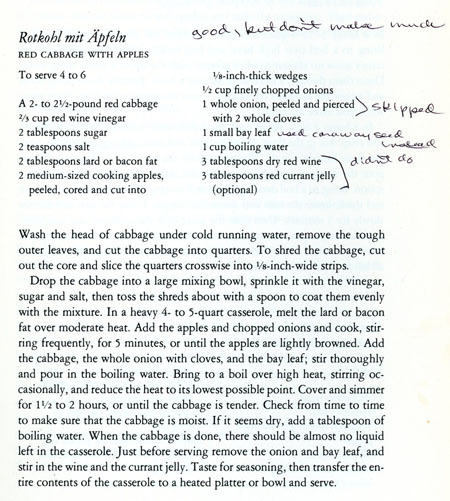 I find that a Cook’s Illustrated recipe might take a bit more concentration to follow than common recipes, but the recipes always work for me. These guide books are all big, heavy, hardback, white-covered tomes. I have eight “grilling” cookbooks, but this is one of my two “go-to” books for barbecue – the other is Weber’s Real Grilling. Weber’s Real Grilling is specific to gas grills, while Cook’s Illustrated Grilling and Barbecue gives for each recipe methods for both charcoal grilling and gas grilling. We have a gas grill, and I have no desire to cook with charcoal. The gas grill is just too easy! I’ll just say “I’m sorry” to those purists who think charcoal is the only way to grill! Grilling and Barbecue begins with introductory sections on “Outdoor Cooking 101″ and Equipment and Tools for Outdoor Cooking”. They are quite useful and complete. The first chapter is “Beef”. Strip and rib steaks, porterhouse and T-bone steaks, filets mignons, steak tips, flank steaks, London broil, hamburgers, prime rib, beef tenderloin, veal chops, beef ribs, and beef brisket are each discussed in detail, describing how to get the most out of each cut of beef. Specific recipes, sauces, salsas, marinades, and rubs are suggested, some of which appear in later chapters in the book. Pork, lamb, chicken, turkey and other birds, fish, shellfish, vegetables, and pizza and bruschetta chapters follow in the same detail and style as the beef chapter. Sides and salads, rubs and sauces round out the book. I think a study “kebabs” would be a good illustration of “Grilling and Barbecue, Cook’s Illustrated Guide“. Sure, I’ve made pork, beef, and chicken kebabs so often I rarely use a recipe, but the meat often comes out dry and chewy, or under-cooked, or unflavorful, and the onions and peppers and other vegetables burned or falling apart. I usually make kebabs the same way, no matter what type of meat I use. Just load up the skewers, brush with a sauce, and put them on the grill – that’s my method. But I decide to use this blog as an opportunity to study how to make really good kebabs. So I turn to the pages and lengthy kebab discussions in this tome – about 4 big pages on average for each type of kebab. Below is what I learn. First, pork. The problem with pork kebabs is that the pork tastes bland and often dries out on the grill. 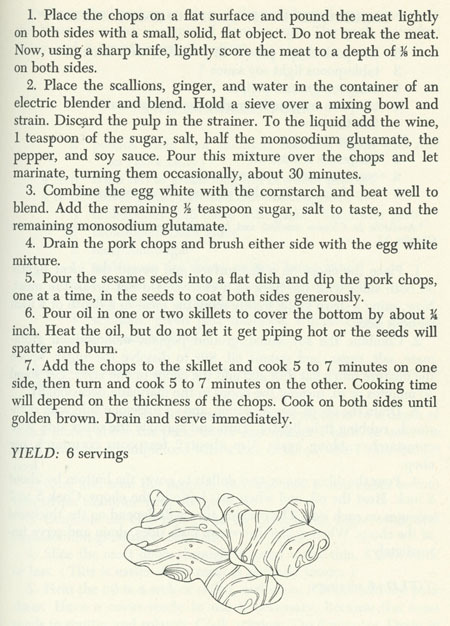 Cook’s Illustrated tried different cuts of pork, and chose pork loin because it has a full flavor, is tender, and an “appealing resistance when you bite into it”. On their early tries, the pork loin dried out on the grill. To overcome this, they tried both brining and marinating, and chose the marinade method because it not only kept the meat “moist and juicy”, but it added “richness of flavor that was lacking in the lean pork loin”. Also, the oil in the marinade improved the pork’s texture and added other flavors to the meat. Not only that, but cutting the pork loin into 1 1/4 inch cubes and “butterflying” them improved the flavor of this rather neutral meat. To butterfly, each cube is cut almost through at the center before marinating, and then folded back together to skewer as a whole cube. On the gas grill, these cubes cooked best over a “more moderate level of heat” than beef, the grill is covered, and the kebabs are turned a quarter-turn every 2 1/2 minutes for about 9-10 minutes total. Cooking the pork to 145˚ was found to be ideal. A study of fruits and vegetables to accompany the pork on the skewers led them to recommend fresh pineapple in 1-inch chunks, bell poppers in 1-inch pieces, and red onion in 3/4-inch pieces. Beef kebabs went through a similar study. 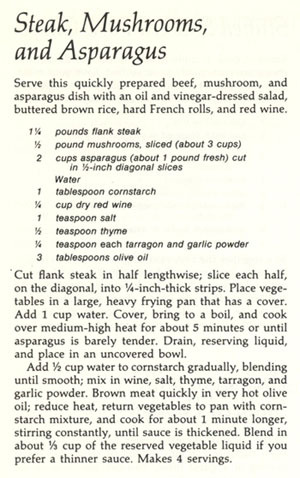 Results: use top blade (flatiron) steaks or sirloin. Butterfly 1 1/4-inch beef cubes and marinate in a non-acidic olive oil based herb mixture, use the same vegetable and fruits as in pork cubes, grill over direct high heat, cover down, turning one-quarter turn every 1 3/4 minutes, until meat is browned, about 7-8 minutes total. Finally, chicken kebabs. 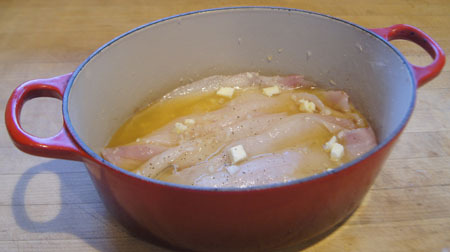 Use chicken thighs cut into 1 1/2-inch chunks and marinate in a olive oil and salt, non-acidic marinade. 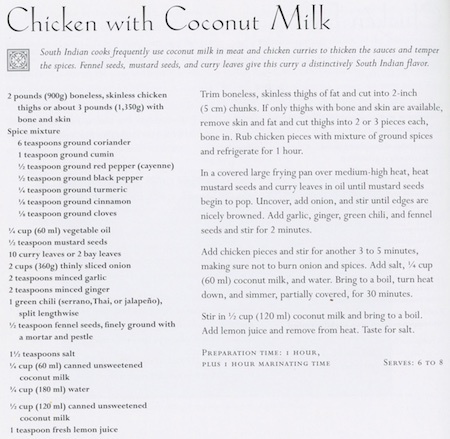 Cook’s Illustrated found “early on” that it was clear that cooking chicken and vegetables together on kebabs “enhances the flavor of both”. After a lengthy study, they chose zucchini, eggplant, mushrooms, bell peppers, onions, bell peppers, small shallots, apples, peaches, pears, and fresh pineapple as appropriate for chicken kebabs. (Cook’s Illustrated doesn’t deem potatoes good for kebabs because they require pre-cooking.) They have a handy table that designates the size to cut each recommended fruit and vegetable and whether or not that fruit or vegetable should be marinated. For grilling, they recommend two skewers per kebab, to facilitate turning them without the chicken and vegetables spinning. Grilling should be done on medium high, uncovered, turning one-quarter turn every 2 minutes, until lightly browned, about 9 minutes total. I am inspired! I’ll carefully follow their instructions and make all these different types of kebabs this summer. Then I can expand to their recipes for fish and shrimp kebabs. Am I going to make kabobs for this blog? No! Instead, I want to cook a pork tenderloin for the two of us. 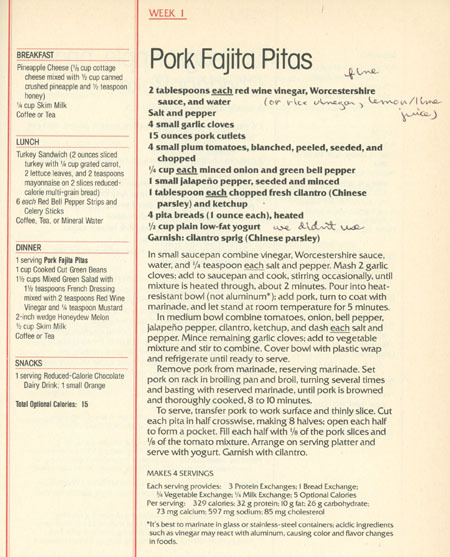 This is a cut of pork that I use a lot – it’s tender, lean, often on sale, and a perfect portion for two people (with a little left over for the next day’s lunch). I usually simply sprinkle with salt and pepper and cook over direct medium high heat, turning about four times. 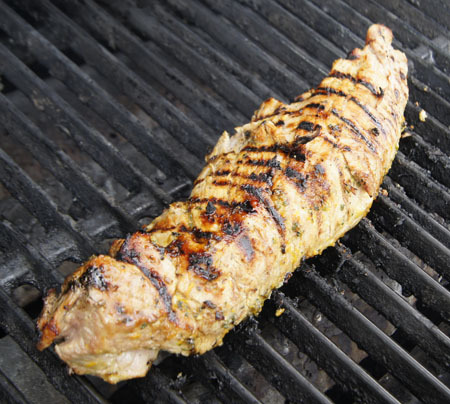 Grilling and Barbecue says to brine the pork tenderloin, use a wet rub, and cook over high heat 3 minutes per side. For copyright protection, I am not scanning in this recipe. Below is my adaptation of the original in Grilling and Barbecue, Cook’s Illustrated Guide. Remove the “silver skin” from the pork tenderloin: simply slide a sharp knife under this thin piece of tendon on the outside of the tenderloin. Dissolve the sugar and salt in several cups of water in a shallow bowl. Add the tenderloin and refrigerate about 1 hour. 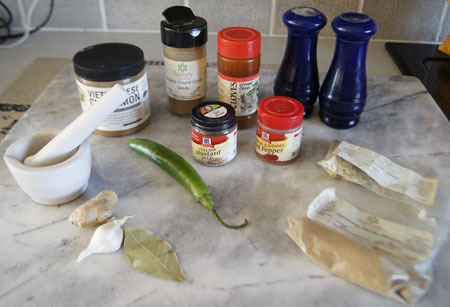 While the pork brines, prepare the wet spice rub – simply mix all the ingredients in a bowl. 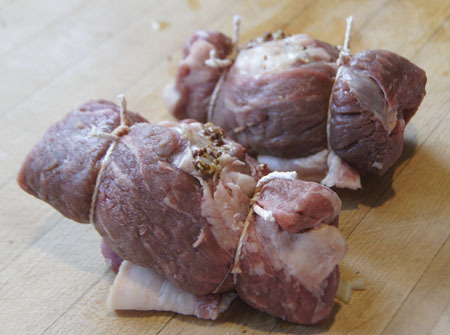 Remove the tenderloin from the brining solution, rinse, and dry with paper towels. Rub the wet spice rub into the tenderloin. Heat a gas grill by turning all the burners to high and with the grill covered. Then, open the gas grill and scrape the cooking grate clean with a grill brush. With the burners still on high, lay the wet-rub-coated pork tenderloin carefully on the grill. Close the cover. 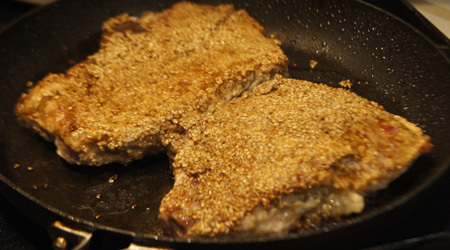 Turn about every three minutes so that all four “sides” of the tenderloin are browned. Using a quick-read thermometer, check that the meat is at 145˚. If not, cook until it is. Yum! This was perfect! Moist and flavorful with great grill marks. 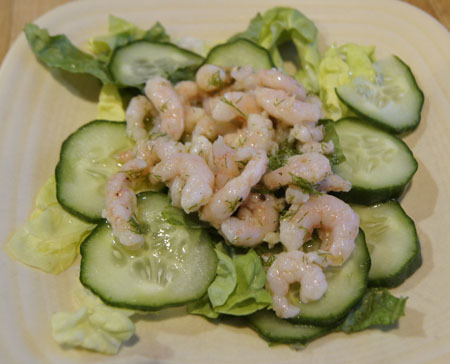 I served it with a green salad and corn on the cob for a light, healthy, tasty meal. 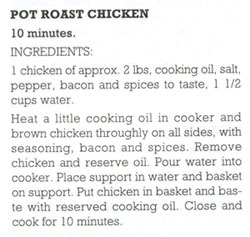 Thank you, Cook’s Illustrated, for another great recipe. 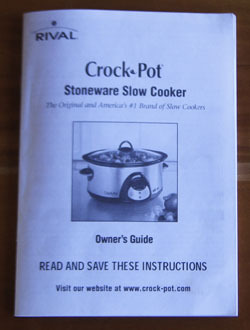 Cookbook #241: Crock-Pot® Stoneware Slow Cooker, Owner’s Guide, Rival, JCS/THG (The Holmes Group), 2006. This is my current crock pot. It replaced a nearly-broken one in about 2006. This one has a removable stoneware crock that makes it easy to clean, a high-low setting, and a timer. This is my first crock pot with a timer, and I’d always get one like this from now on. 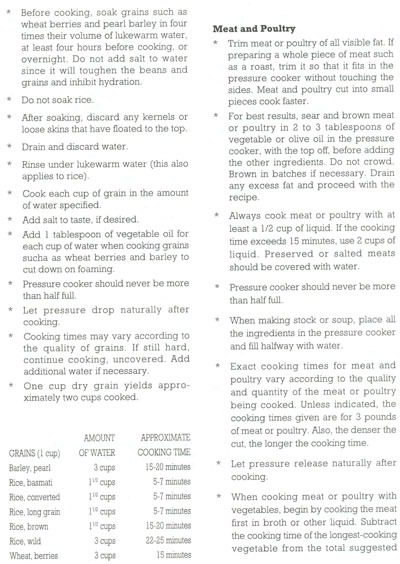 I am going to keep this cookbook, largely because it has “official” instructions and also warranty information. And also, the handful of recipes really look like they will “work”. If you read any of my other crock pot posts, you will know that I think crock pots turn good food into indiscernible mush with a bad recipe. A Yes – if cooked on LOW. We recommend a small amount because the gravies are especially tasty. 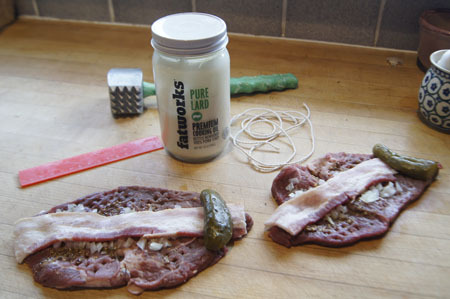 The more fat or “marbling” the meat has, the less liquid you need. 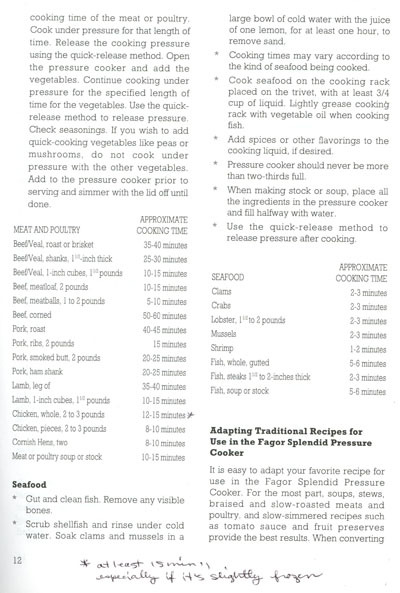 The liquid is needed to properly soften and cook vegetables. This hits home to me, because lately I have been slow-roasting beef roasts in the oven. I might try my crock pot next time. 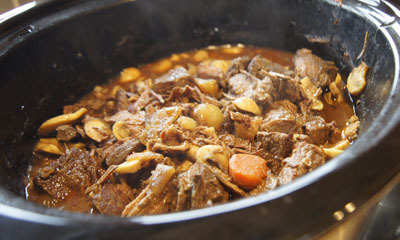 The first recipe in Crock-Pot® Stoneware Slow Cooker is for Pot Roast of Beef. 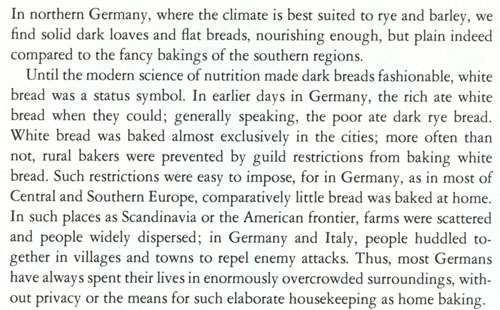 Someday I’d like to try this recipe and compare/contrast with the method I now use from Cook’s Illustrated (Cover and Bake). 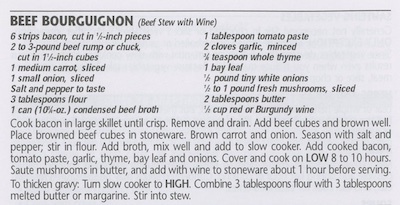 The second recipe is for Beef Bourguignon, and that is what I’ll make for this blog. 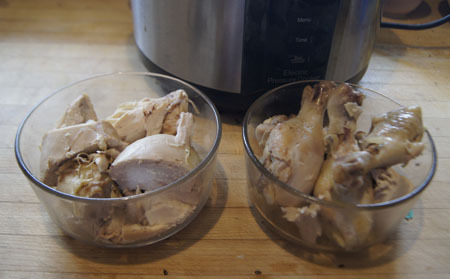 Another recipe I have my eye on is Chicken With 40 Cloves of Garlic, something I’ve always wanted to make. 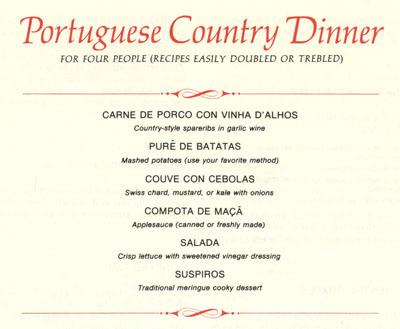 I might also consult the recipes for meat loaf, pork chops and roast, whole chicken, Swiss steak, French onion soup, jambalaya, and game hens (roasted with no added water). My version is below. I added more stock and more wine, and found that these changes gave just the right amount and thickness of gravy at the end. I used double the amount of tomato paste. I did not add the 3 tablespoons butter plus 3 tablespoons flour at the very end to thicken the broth, but I suggest you do that if you want a really thick gravy. Cook the bacon until crisp. Drain and set aside. Place the browned beef chunks and the cooked bacon in the crock pot. Add a bit of oil or bacon fat to the pan used to brown the beef, then add the carrot and onion and cook until brown. Add the 3 tablespoons flour and mix in as well as possible, then add the beef broth; mix well and add the vegetable-broth mixture to the crock pot. Add about half the wine, the tomato paste, garlic, thyme, bay leaf, and tiny white onions to the crock pot. Add salt and pepper to taste. Stir to mix. This was totally yummy. I loved the rich, dark broth-gravy. I am glad I didn’t add the flour/butter mixture at the end to thicken the gravy. It was rich and thick enough for me as it was – it was indeed “especially tasty”. I’m also glad I added more wine than called for in the recipe. 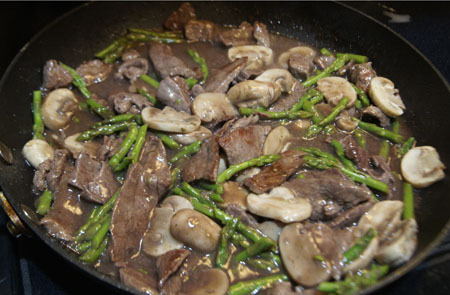 I liked the sautéd mushrooms added for the last hour – their texture and flavor were not lost by 8 hours of cooking. To serve, I cooked some potatoes, carrots, and peas and stirred them into our servings of bourguignon. 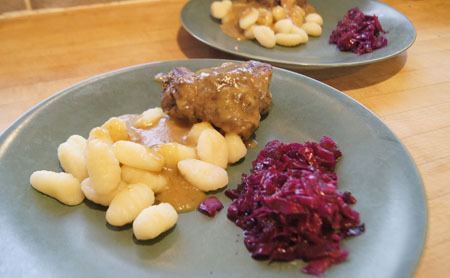 I often like stew prepared with potatoes added later, because for the two of us, I usually cook a lot of stew-type meat at once and freeze some for another meal, and potatoes do not keep their texture after freezing. Also, this method opens up variations: you could serve the bourguignon over mashed potatoes, pasta, rice, gnocchi, polenta – you name it. Or keep it without added carbs for a nearly low-carb meal. I get to enjoy this delicious bourguignon a few more times, and quickly, by thawing the portions I stowed away in my freezer. This recipe was a success! Cookbook #229: Five Hundred ways to prepare California Sea Foods, Compiled by State Fish Exchange, California State Printing Office, Harry Hammond, State Printer, Sacramento, CA, 1934. The sheer abundance of fish covered in this book is amazing – about 60 species! 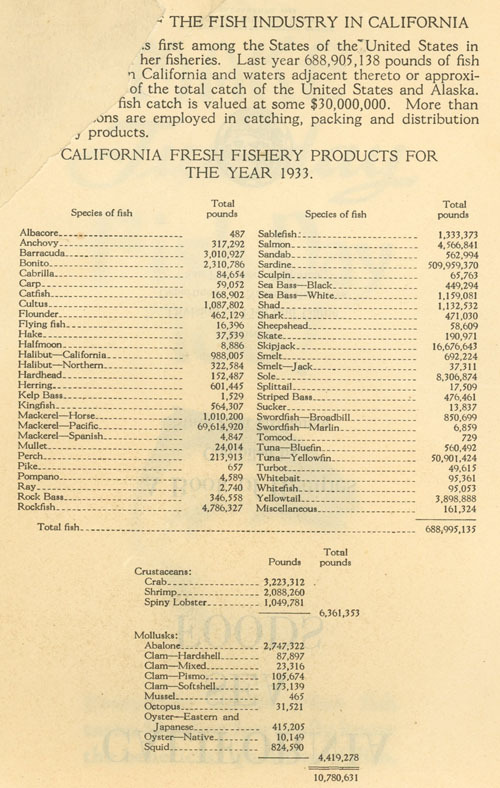 The table below shows the types, poundage, and total amount of fish produced in 1933 in California. 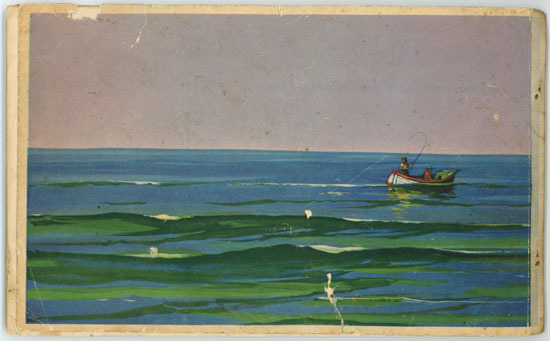 California Sea Foods encourages Californians to eat more fish. 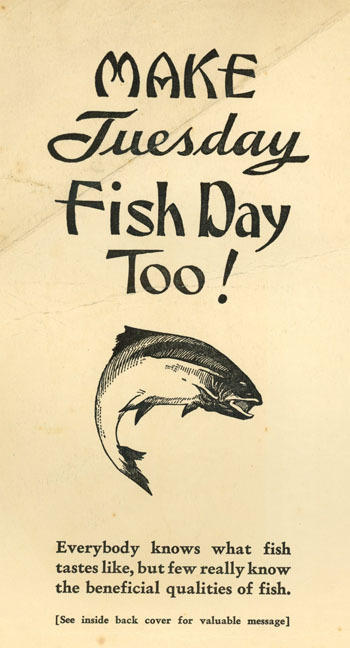 “Make Tuesday Fish Day Too!” reads the front inside cover. 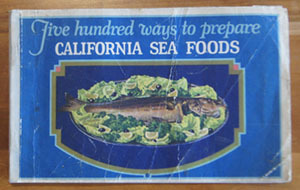 Five Hundred ways to prepare California Sea Foods has a very useful table of contents/index, handily referring the reader to recipes for cooking and serving all of the fish in the above table. 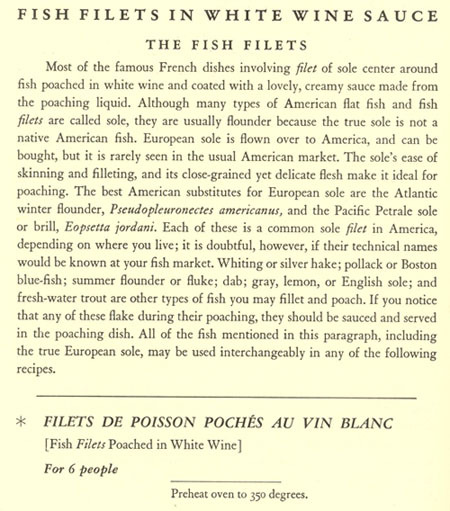 The fishes can be baked, boiled, cooked in a bouillabaise or cioppino, broiled, made into cakes or croquettes or fritada, fried, jellied (made into a mold), made in a pie, put in a salad or sandwich, put in a souffle or soup, or steamed (and I still haven’t listed all the methods!). 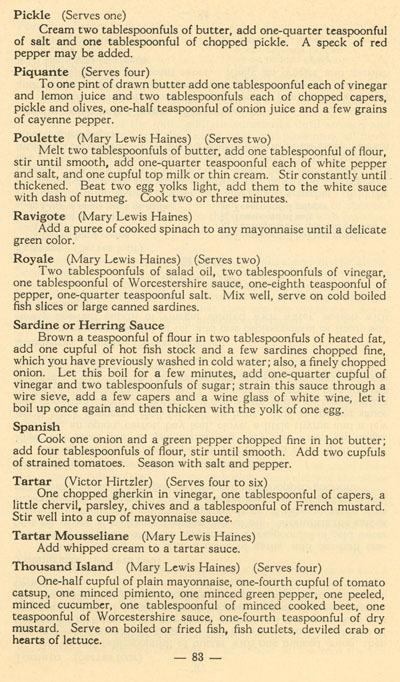 After the fish recipes are lots of recipes for fish sauces. 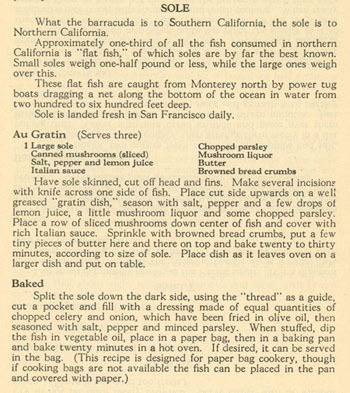 That’s not the only page of recipes for sole – they go on for four more pages! 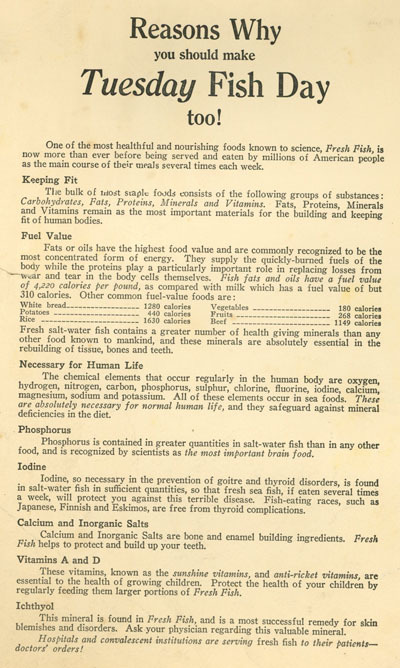 The book ends with “Reasons Why you should make Tuesday Fish Day too!” touts fish as “one of the most heathful and nourishing foods known to science”. Mix all of the above together and serve. This tartar sauce was amazingly good. Fresh and zingy. I served it with salmon along with wedges of lemon. 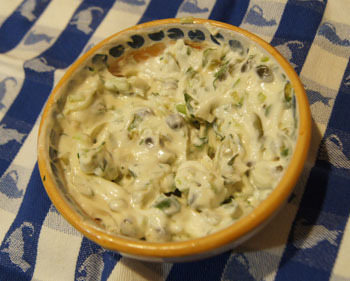 I usually make “tartar sauce” by mixing together mayo or yogurt with a little pickle relish and tarragon. 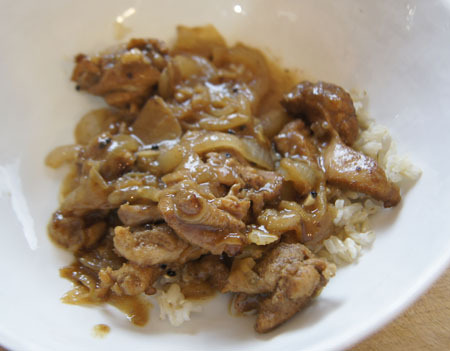 But this one is a big step up in flavor, and still very easy to make. I am sure I’ll use it a lot in the future! I’ll end with the photo on the back of the book. Peace. Cookbook #227: Mastering the Art of French Cooking, Julia Child, Louisette Bertholle, Simone Beck, Borzoi Books, Alfred A. Knopf, NY, 1961. Thirtieth Printing, June, 1978. “Julie & Julia”, the 2009 film starring Meryl Streep and Amy Adams, portrays the true story of Julie Powell, a young New Yorker who took on the challenge of cooking all 524 recipes in Mastering the Art of French Cooking. She covered her experiences in a blog, and eventually a book: Julie and Julia: 365 Days, 524 Recipes, 1 Tiny Apartment Kitchen. 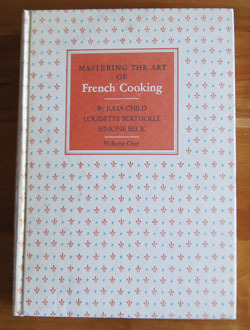 When the movie came out, I ran upstairs to see if I had a copy of Mastering the Art of French Cooking. And yes, it was on my bookshelf! Mastering the Art of French Cooking always intimidated me. My copy is barely wrinkled, no food stains mar the pages. In the past, no more did I want to read it that I would want to read a book on advanced physical chemistry. I’ve grown up a bit though, and taken a class on classic French sauces. I’ve also learned how to make my own great stocks. I’ll say “I am wiser”, and am feeling this especially this week because I just turned a year older. Now as I turn the pages of Mastering the Art of French Cooking, I can understand the language and appreciate the wisdom, and I smile warmly at Julia Child’s complete love of cooking. On my birthday this week, I got up late and decided to make an omelet. And I don’t just mean “make an omelet”, I wanted to make an omelet according to Julia’s directions. I wanted nothing else for breakfast! Just an experiment. It was, afterall, my birthday. 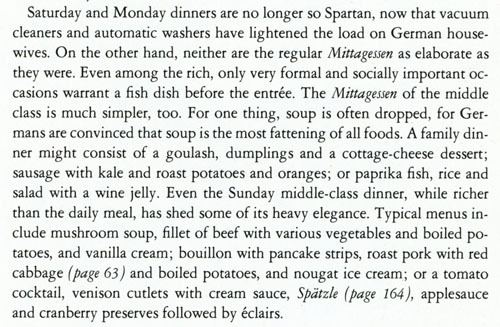 I open Mastering the Art of French Cooking to page 127. Julia Child says it will only take 30 seconds to make the omelette. And, “An omelette cannot be made in a sticky pan. The eggs must be able to slide around freely. This is why it is a good idea to have one pan that is reserved for omelettes only.” And the type of pan Julia Child likes the best? The French type of plain iron pan with sloping sides. Aha, I own just such a pan! I got it about a year ago. But I banished it to the basement because it is so heavy and hard to clean. Today I jog down to the basement and retrieve the pan. I scrub it with steel wool and soap, dry it carefully, and heat it to get all the water off. Then I rub it with oil and wipe all that off. I set it on the stove. I took the first bite and . . . heavenly tastes and textures burst in my mouth. Dang that was a great omelette. 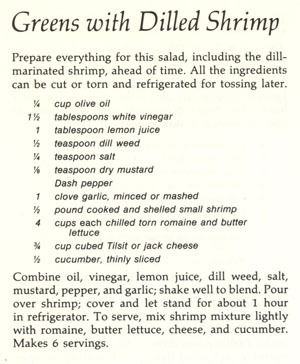 Thank you Julia Child! I spend several days paging through Mastering the Art of French Cooking. I took lots of notes! 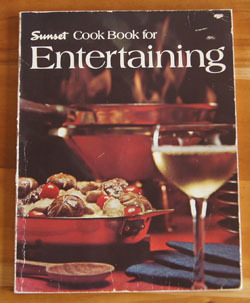 I really do like this classic cookbook. 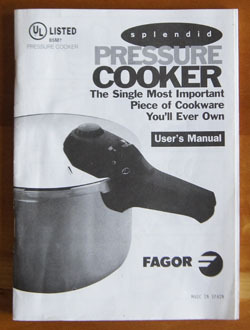 I suggest every serious cook buy or borrow a copy at some point in their life. 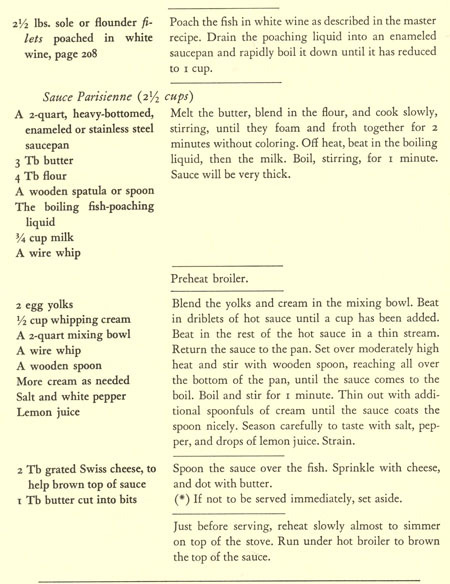 The only drawback to Julia Child’s recipes is the heavy use of butter, cream, and egg yolks. Yes, I have read The Big Fat Surprise, a book that disputes the generally accepted idea that the fats in these foods are bad for you, and instead encourages us to include them in our diet. But still, calories are calories, and stick on my body as weight when I eat too many. Just saying. 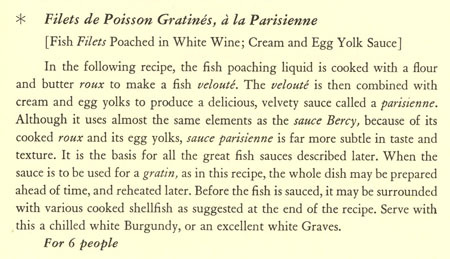 But this week, I will indulge in a Julia Child recipe: Filets de Poisson Gratinés, à la Parisienne, or “Fish Filets Poached in White Wine; Cream and Egg Yolk Sauce.” This recipe is a great example of Julia Child’s presentation style. Below is my adaptation of this recipe. Note that you need a baking dish that you can heat on the stove top and also place in the oven. I used a LeCreuset. Turn on the oven to 350˚. On the stovetop, bring the fish almost to simmering. Butter both sides of the piece of parchment. Place the LeCreuset in the 350˚ oven. Bake for 8 minutes, check for doneness by piercing with a fork (you should find just a slight resistance), and bake a few more minutes only if necessary. During the baking, the cooking liquid should be at a light simmer. 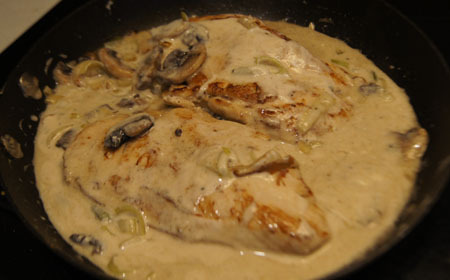 Drain the cooking liquid into a small saucepan, leaving the poached fish in the LeCreuset, covered with the parchment. Boil the cooking liquid until it is reduced to 1/2 cup. This will be use in the sauce. Melt the 1 1/2 tablespoons butter in a small sauce pan, then add the flour and stir until it is all mixed in. Continue cooking until it thickens but do not cook it until it browns. Off heat, beat in the hot cooking liquid and the milk. A whisk works well for this step. Put the pan back on the stove and bring to a boil, stirring constantly. Boil about a minute – the mixture will be thick. In a bowl, blend the egg yolk with the cream, using a whisk. Add small amounts of the hot sauce and continue beating until about 1/2 cup of the hot sauce is added, then add the rest of the hot sauce in a thin stream. Put the mixture back in the pan and boil and stir 1 minute. You can thin with a little cream if it is too thick for your tastes. Add a few drops of lemon juice and salt and pepper. Spoon the sauce over the poached fish (take the parchment off first), then dot the top with the 1/2 tablespoon butter and the Swiss cheese. On the stove top, over low heat, heat until it is just simmering. Put the dish under the broiler until the top of the sauce is brown. 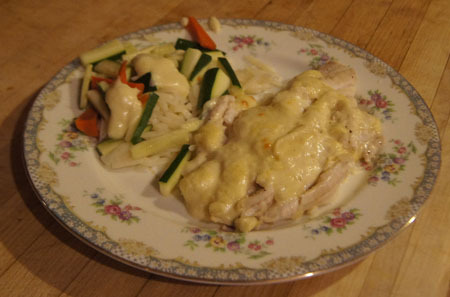 What is nice about this dish is that you can assemble it with the poached fish covered with sauce, and then do the stove-top heating and broiling steps just before serving. 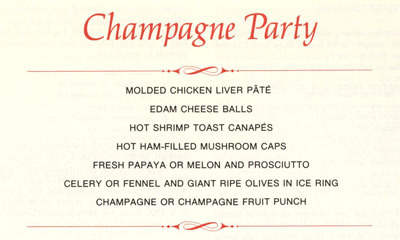 It’s important to bring this dish to the table hot and bubbly. I served with a little orzo and steamed julienned zucchini and carrots on the side. I also served a loaf of my own no-knead bread. 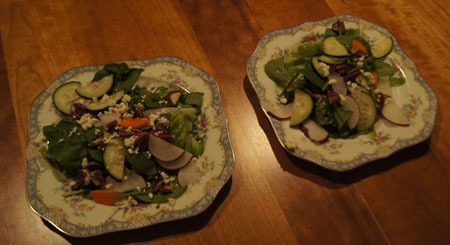 And a couple pretty green salads. For dessert? Fresh blackberries over ice cream. I took my first bite of the fish and then I had to set down my fork so I wouldn’t gobble up the rest too fast. This is absolutely delicious! 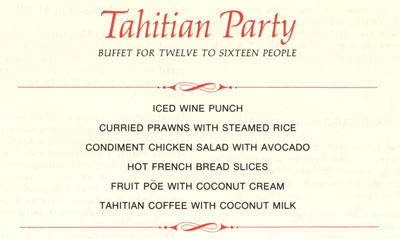 “One of the best twenty-five meals ever in my life” was my comment. 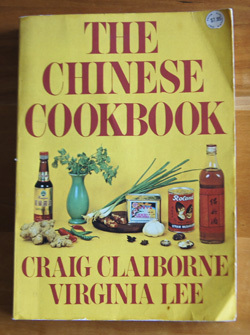 Cookbook #224: The Chinese Cookbook, Craig Claiborne and Virginia Lee, J. B. Lippincott Company, Philadelphia and New York, 1972. 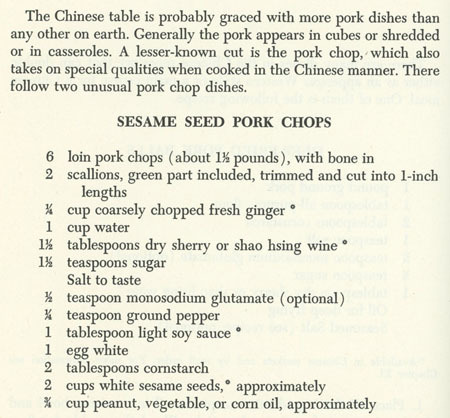 The Chinese Cookbook is one of my favorite cookbooks. I always keep it in my kitchen for ready reference! 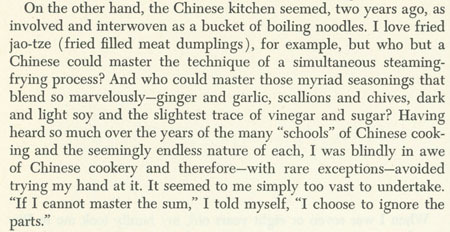 Virginia Lee was a renowned Chinese cook who came to the US in 1967. Claiborne interviewed her for an article, and ended up applying for her cooking class. She only taught ten students at a time! 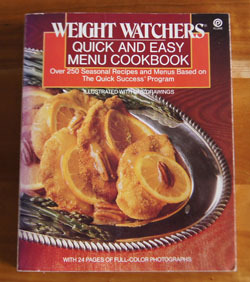 But she accepted Claiborne, and eventually they wrote this cookbook together. 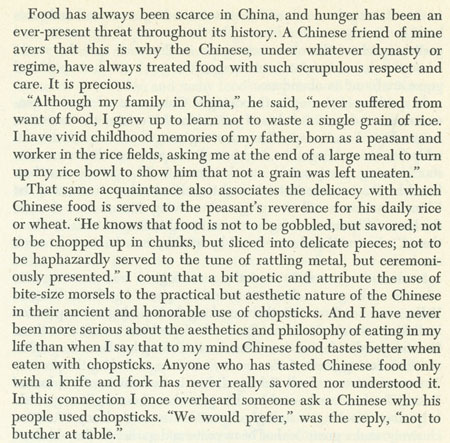 I want to share another excerpt from the introduction, because it says so much about Chinese cooking. 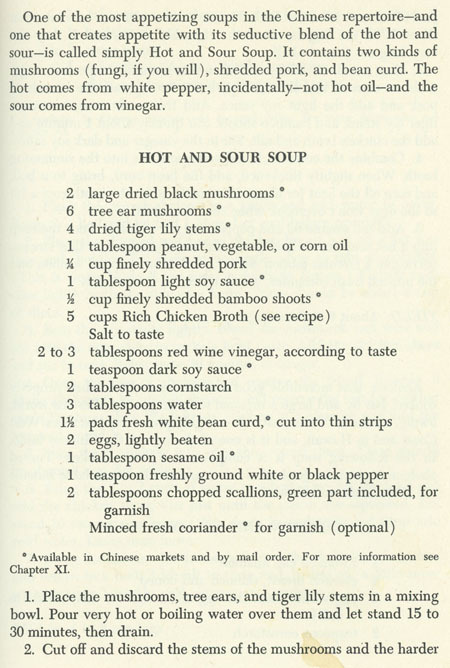 I’ve made this Hot and Sour Soup many times. Dried black mushrooms, tree ear mushrooms, and dried tiger lily stems! Ages ago, I had to go all the way to Denver to a Chinese market to find all of these ingredients. Nowadays I go to the Asian Seafood Market in Boulder. Sometimes I leave out these exotic ingredients, if I have none on hand, or I use fresh shitakes and skip the tree ear and black mushrooms tiger lilies. Not as much fun, but still a good soup. 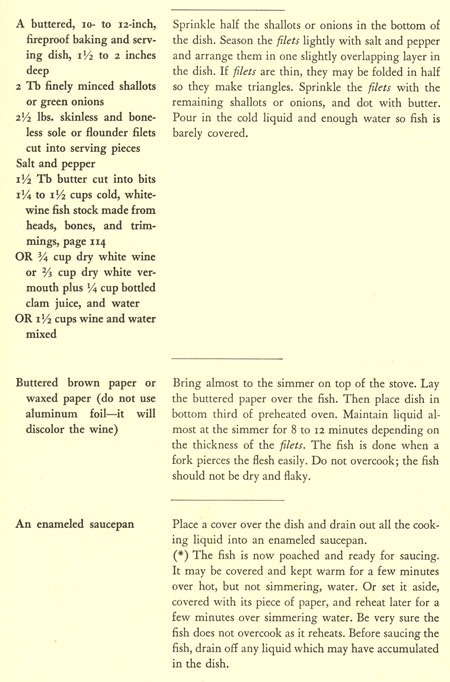 Claiborne mentioned Fried Jao-Tze in the introduction (excerpt at the top of this page). Jao-tze (or pot stickers) are little round wonton-type skins, filled with pork and shrimp and vegetables, that are first fried to get the bottoms brown, and then doused with a bit of water and covered and steamed until done. They are served with a dipping sauce made from soy sauce, vinegar, sesame oil, ginger, garlic, sugar, and hot oil. 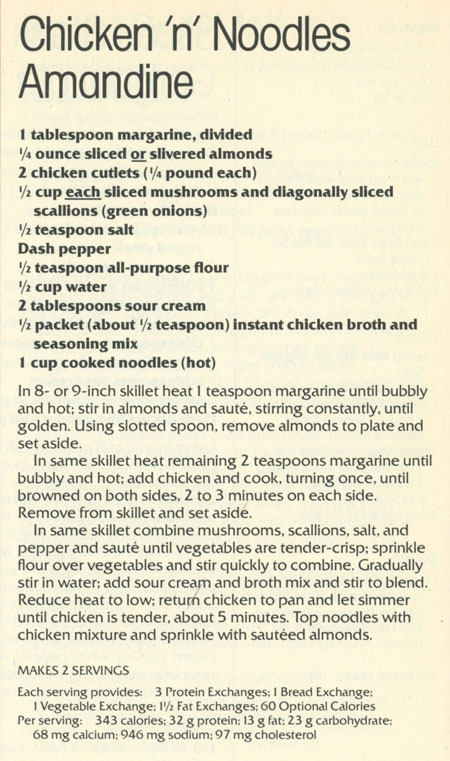 Years ago, before I had ever heard of Jao-Tze from other than his cookbook, one adventurous day I decided to try these. And they were amazing! It was only later that I saw Jao-Tze pot stickers appearing at restaurants, at University event buffets, and even in the frozen food section of markets. 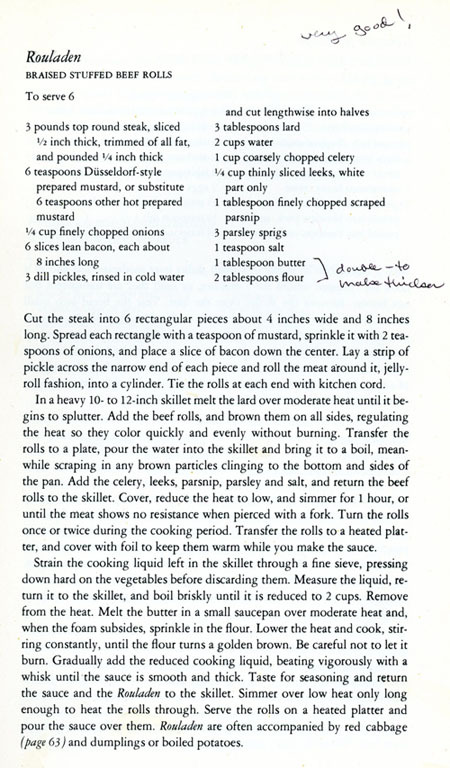 I have made Claiborne and Lee’s recipe at home many, many times and they are much better than any I have had out. 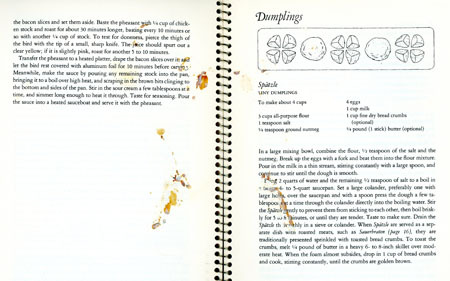 Another dumpling I learned about in this cookbook are “Shiu May”. 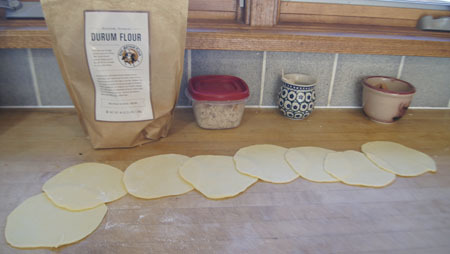 I use square wonton skins, fill with shrimp and pork and vegetables, then steam them. The Chinese Cookbook’s Kung Pao Chicken is extremely tasty and extremely easy. It calls for raw, shelled fresh unsalted peanuts, and I find them at the Asian Seafood Market. It also calls for bean sauce, hoi sin sauce, and chili paste – these ingredients are usually in supermarkets, and they have a long shelf life once opened, kind of like ketchup. If you put enough dried hot peppers in it, your Kung Pao Chicken will please a guest who really likes hot food. I did a google search to see what others thought of The Chinese Cookbook. A couple bloggers (Undercover Caterer and Collectible Cooking) raved about “The Best Fried Rice”, so I looked it up in my copy of the book. “This fried rice is a bit of a masterpiece” state Craig Claiborne and Virginia Lee. Whoa. I am going to have to try this masterpiece soon. 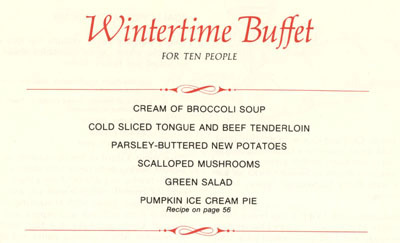 A couple other recipes I’d like to try are “Beef with Oyster Sauce” and “Beef with Peas and Peanuts”. 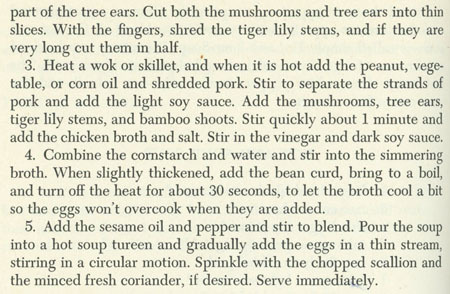 Note: I covered another Chinese cookbook that I like in this blog: The Cooking of China, by Emily Hahn and the Editors of Time-Life Books. 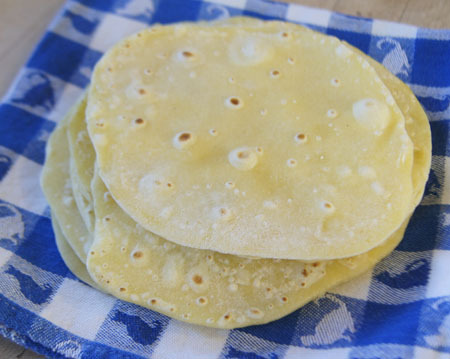 I put lots of photos of ingredients and one photo of my bamboo steamer in that post. 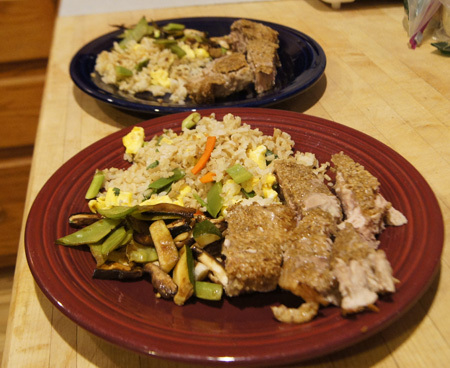 For this blog, I’ll make the Sesame Seed Pork Chops. I made these pretty much as per the above recipe, except I left out the monosodium glutamate, and I halved the recipe for two people, but did not halve the amount of egg white/cornstarch mixture. I used bone-in pork sirloin chops, but actually, next time I’d prefer to use boneless pork sirloin. Pound the pork chops lightly, then make cross hatches on both sides, using a sharp knife and cutting down to about 1/8 inch deep. Set aside. Place the green onion, ginger, and water in a blender (I used a mini-processor). Blend well. Pour through a strainer into a bowl; discard the pulp. Add the sherry or shao hsing wine, sugar, soy sauce, and salt and pepper. 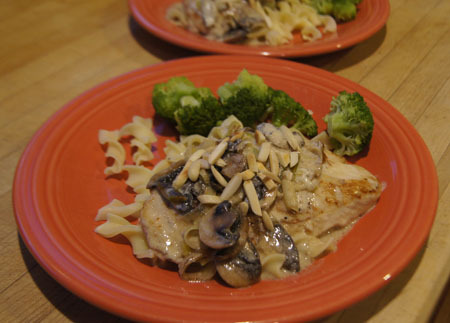 Pour this mixture over the prepared pork chops in a flat dish or bowl. Marinate at least 30 minutes, turning occasionally. Combine the egg white with the cornstarch and beat well to blend. Add a bit of sugar (about 1/4 teaspoon) and a little salt. Put the sesame seeds into a flat dish. Pour oil into a skillet to cover the bottom by about 1/4 inch, then heat, but do not let it get “piping hot or the seeds will spatter and burn”. Drain the marinade off the porkchops. Put them in the egg white mixture to coat both sides, then dip them in the sesame seeds to coat both sides generously. Put the coated chops in the heated skillet and cook 5-7 minutes (or until golden brown) on one side, then turn and cook 5-7 minutes on the other side. Cooking time will depend on the thickness of the chops. These turned out well. 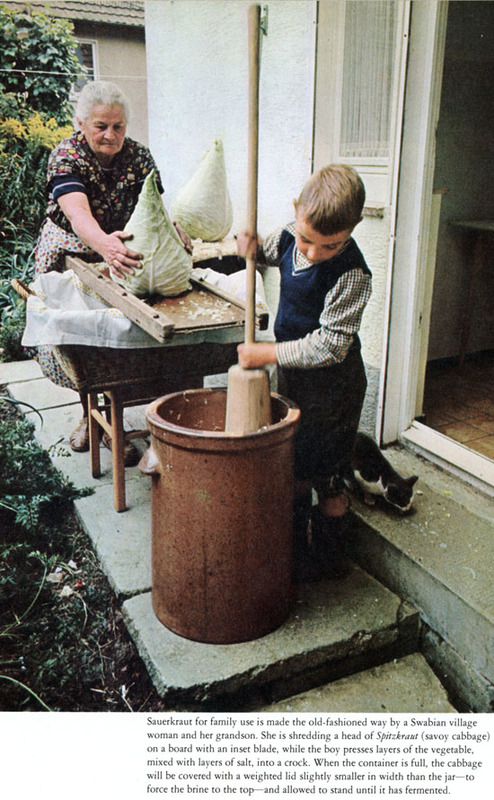 I especially liked taking the green onion-ginger mixture out of the blender – it was green and smelled wonderfully of ginger. The sesame seed layer on the pork chops tended to lift off when cutting them, but it was delicious. I think that boneless pork chops would work better, because they would cut easier into pieces, although the bone-in ones were particularly juicy. To serve, I sliced the cooked chops into large chunks. It was messy because I had to avoid the bone. But, the pork was very, very juicy and flavorful. I served with fried rice and snow peas and fresh shitakis.